We all feel tender and raw sometimes, like a snake who has recently shed his skin. Whether in our relationships or our work, there comes a time every so often when we need to pause and go within. The pause allows our fresh new skin to toughen up, to fully form around our new expanded self. Remembering not to panic is important. The oppressive feelings of fear and anxiety can bring back memories of past endings. The endings of relationships or jobs, and those memories of our first, or worst, ending can cause us to shut down, believing that our world is changing forever and we have no say. Here is the truth, in marriages, friendships, and careers, we have to roll with the times. We have to realize that if something lasts long enough, change, growth, reset, or reinvention will happen by the very design of our Universe. When it feels time for another expansion, pause before deciding something bad is happening. Don’t resist the signs and signals that growth is taking place, breathe. Pause to reflect on what has been outgrown or what new growth needs to be accommodated in the landscape. Have faith in your path, allow time for reflection, exploration, and your confidence to return. Expansion can turn our worlds upside down for a little while and it is fine, nothing lasts forever. 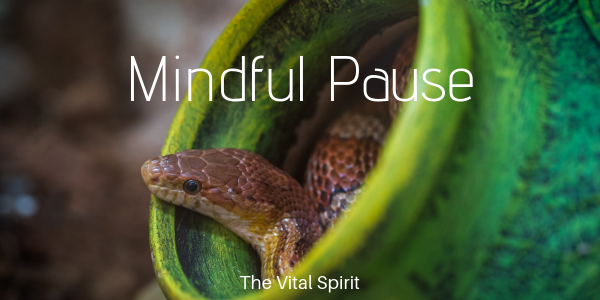 Honor the pause, allow it to nourish you and point you in your new trajectory.